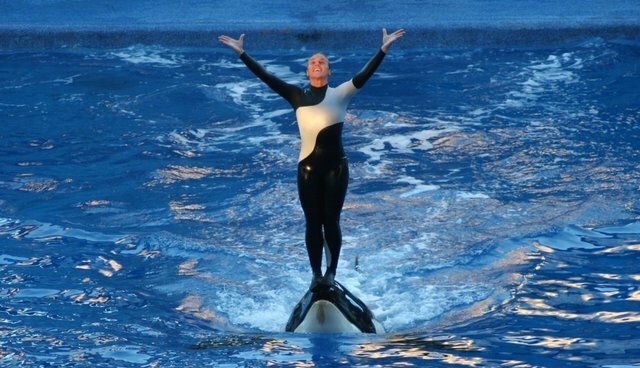 The chief executive officer of the Blackstone group, the New York-based private equity firm with the largest stake in SeaWorld Entertainment, Inc., suggested that SeaWorld trainer Dawn Brancheau violated safety rules during the incident that led to her death in 2010 -- despite previous claims by SeaWorld to the contrary. The amusement park "had one safety lapse -- interestingly, with a situation where the person involved violated all the safety rules that we had," Stephen Schwarzman, whose company owns a 43 percent stake in the company, told CNBC on Thursday. Schwarzman was responding to a question about the CNN documentary "Blackfish," seemingly referring to the death of Brancheau, though he didn't name her explicitly. You can see a recording of the interview below. Contradicting Schwarzman's statements, SeaWorld representatives have said that Brancheau, who was killed by a six-ton orca named Tilikum and became the subject of "Blackfish," followed all safety protocols, the Orlando Sentinel reports. Top SeaWorld officials have even testified under oath that Brancheau made no mistakes. During a legal hearing in the fall of 2011, Kelly Flaherty Clark, SeaWorld Orlando's curator of animal training, called the accident entirely unpredictable and said Tilikum did not exhibit any signs -- or "precursors" -- that could have warned Brancheau that he was about to grab her. In the immediate wake of Brancheau's death in 2010, SeaWorld claimed that the trainer "was responsible because she dangled her ponytail too close to him," writes the Oceanic Preservation Society in an open letter. Former head trainer Thad Lacinak even told "Good Morning America" that it was "her mistake." In several statements afterward, the SeaWorld said: "The company has never blamed Dawn for what happened." Mr. Schwarzman was unaware of the precise circumstances of the incident and his comments did not accurately reflect the facts of the accident or SeaWorld's long-standing position on it. Dawn's death remains of source of great sadness for her family, friends and colleagues and Blackstone regrets the error. SeaWorld is embroiled in an ongoing legal battle with the U.S. Occupational Safety and Health Administration, which fined the park $75,000 for three safety violations in 2010 -- a decision that SeaWorld appealed and argued down to $12,000. But the judge upheld a ruling recommended by OSHA that banned humans from being in the water with orca whales unless there were physical barriers to reduce the risk of serious injury or death. There have been about two dozen cases of attacks on humans in marine parks and none in the wild. SeaWorld was bought by the Blackstone Group for $2.5 billion in 2009 and took the company public last April. In December, the company sold of its majority stake of SeaWorld, but still makes huge profits off the company in various payments and fees. "SeaWorld is a remarkable business," added Schwarzman, who said he has not seen "Blackfish." "And people who go there love it." SeaWorld has been contacted for comment.